After a very persuasive conversation with Sophia, a foodie friend from Berlin, my mother and I began our San Francisco pizza tour at her favorite pizzeria and a new restaurant for us, Caffé Baonecci. Caffé Baonecci became the first stop on our San Francisco pizza tour, a tour we decided to embark on for a few reasons: 1) for our enormous love for pizza, 2) because of the many delicious pizza places we love but realized we had not been to in a while, 3) because of the many pizza places we have always been meaning to try but have yet to, and 4) because soon enough this smorgasbord of pizza on a seven-by-seven mile peninsula will no longer be my food playground. In a way, this pizza tour represents my last (drawn-out) foodie hurrah in San Francisco before I leave for the East Coast in the Fall. Caffé Baonecci far exceeded our expectations. When we arrived, I was honestly surprised by the casualness and homey feel to the restaurant. I was a little bit afraid it was going to be more of a pizza shack than a venue for finely created pizza. But as soon as we met our waiter I was in love. Not only was he good looking, but he was obviously Italian and spoke in a thick accent and with a very evident love for the food he was serving. We ordered the burrata salad, the Cannelloni, the Cigniala wild boar pizza, and the Contadina (curly pear) pizza. 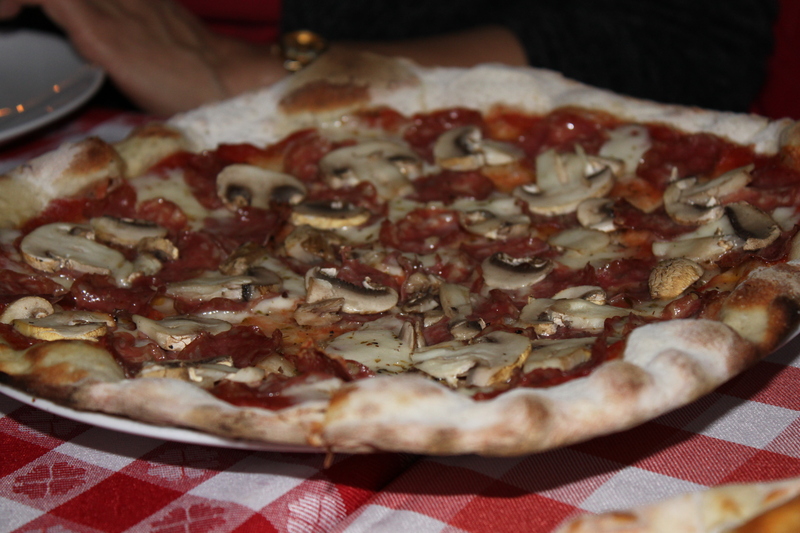 The pizzas were by far the best, and outshone all the other dishes. The Contadina was aesthetically beautiful, piles of intertwined curly pear shavings on top of thin crispy crust with mozzarella and gorgonzola. It was fresh in taste and a refreshingly different type of pizza as well. The Cigniali was also superb, though I was slightly disappointed to find that the wild boar, which sounded very different, was extremely similar to pepperoni. We will be returning to Baonecci – this I can guarantee. Our family has decided, however, that next time we will probably only order pizza. Although the flavors were not mind-blowingly complex or original, they were tastefully fresh and traditional all at once.